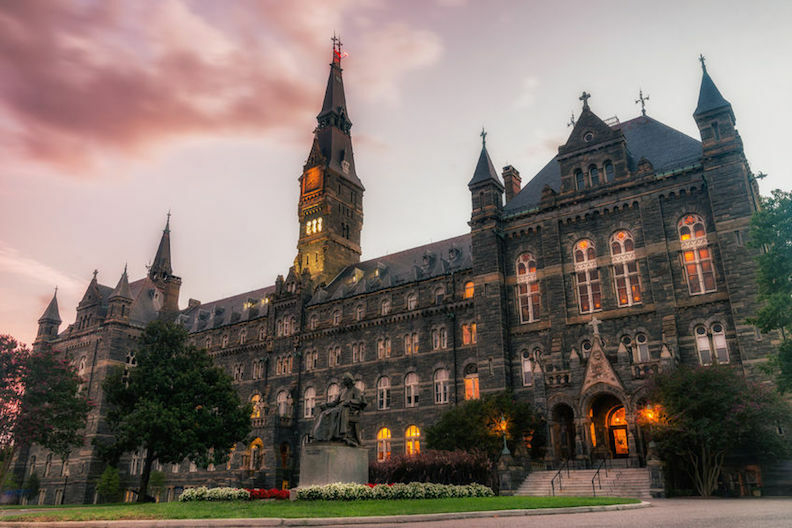 Georgetown University (familiarly known as just Georgetown) is one of the most frequently searched universities in the United States, according to a recent internet keyword search of American colleges. Georgetown is a private research university, located in Washington DC. 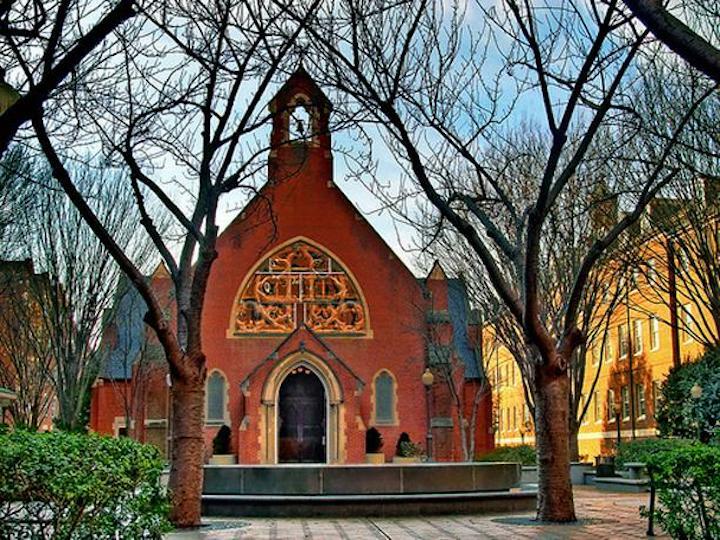 Founded by Jesuits in 1789, Georgetown is America's oldest Catholic college, although the school has always been governed independently of the Church. In fact, most students at Georgetown are not Catholic. Georgetown maintains an enrollment of approximately 18,000 students each semester. The university offers undergraduate degrees, graduate degrees, and professional certificate programs, and also has a law school and a medical college. The acceptance rate for Georgetown is about 17%. The student faculty ratio is approximately 11 to 1. Many Georgetown graduates follow careers in government or international affairs. Notable graduates of Georgetown include former U.S. President Bill Clinton, as well as about 20 members of Congress, and the heads of state of more than a dozen countries. Georgetown University is accredited by the Middle States Commission on Higher Education, and is a member of the Association of Jesuit Colleges and Universities (AJCU). Shown above: An aerial view of the Georgetown campus, which borders the Potomac River. Here are the answers to some frequently asked questions about Georgetown. 1. Where is Georgetown University? The main campus of Georgetown is located in Washington DC, although the college has three other DC locations, as well as study-abroad locations in Italy, Qatar, and Turkey. Above: Healy Hall is the architectural centerpiece of Georgetown's main campus. 2. What is the organizational structure of Georgetown University? 3. What undergraduate studies are offered at Georgetown University? Undergraduate course offerings at Georgetown cover a wide range of topics. Above: The Dahlgren Chapel adorns the main campus of Georgetown. 4. What graduate programs are available at Georgetown University? Click here to see a Complete List of PhD Programs at Georgetown, as well as professional programs in medicine and law. 5. What programs are offered at the Georgetown University Law Center? Georgetown Law offers more than 500 courses at the J.D. level, and more than 300 graduate law courses. 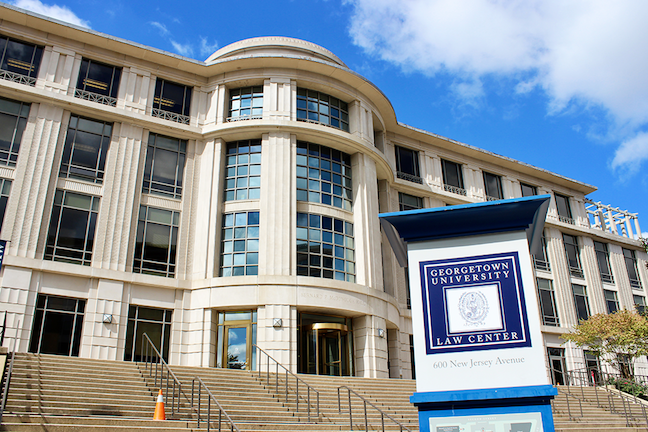 Georgetown Law provides a full legal education that includes clinics, community service, externships, mock trials, and more. Above: The Georgetown Law Center. 6. How much does it cost to attend Georgetown University? These costs do not include room and board, or certain mandatory fees. Other fees may also apply, such as application fees, parking fees, technology fees, health fees, insurance fees, registration fees, exam prep fees, and others. Financial aid is available to many incoming and continuing students who fill out the FAFSA form. Aid may come in the form of grants, loans, scholarships, work study programs, or private donations. Above: The Hoyas in action. 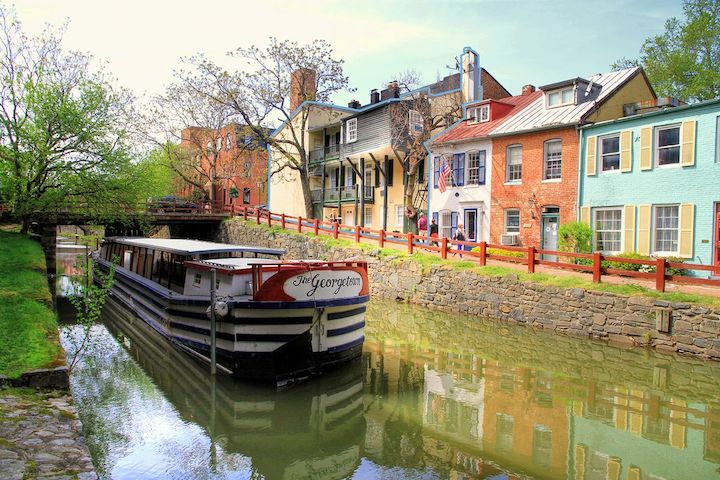 Above: Charming row houses line the C&O Canal in an upscale Georgetown neighborhood. 7. 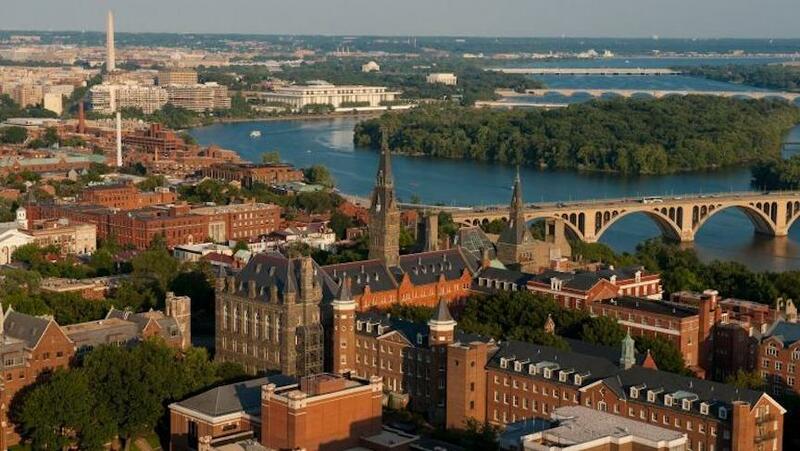 What is the Georgetown University campus like? The main campus of Georgetown spans just over 100 urban acres in the heart of Washington DC, just about a half mile north of the Capitol building. The campus houses 54 buildings, and is characterized by many fine examples of Collegiate Gothic and Georgian brick architecture. Campus landmarks and attractions include Healy Hall and the Georgetown Astronomical Observatory. Both are listed on the National Register of Historic Places. Also noteworthy is the Dahlgren Chapel. More modern architectural forms include the Intercultural Center and the Reiss Science Building, among others. 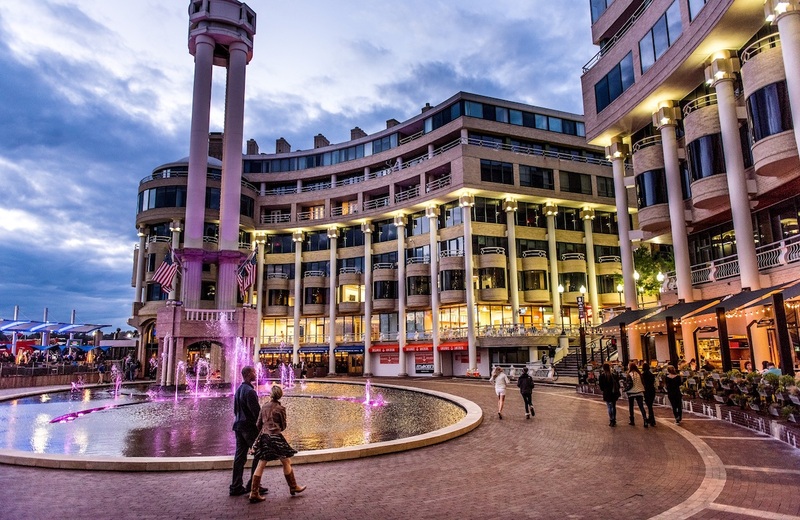 A car is not needed for this area, as the town is very walkable, and public transit needs are served by the Washington Metro. The school colors are blue and grey. 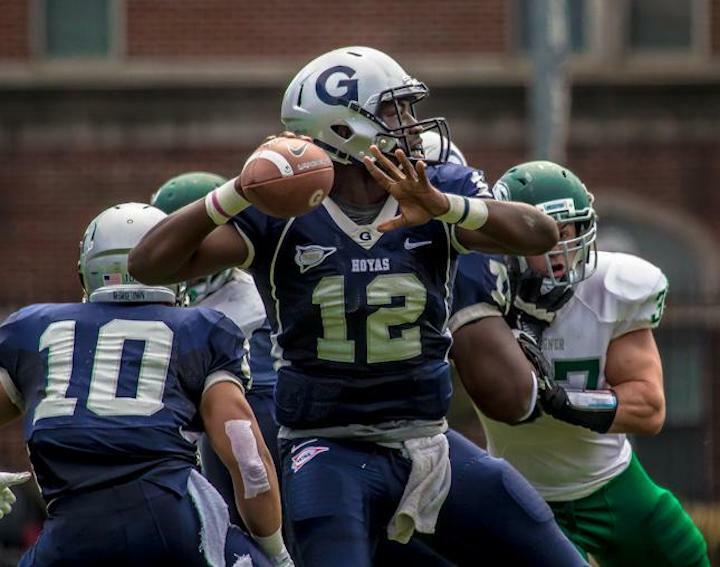 The varsity athletes at Georgetown are called the Hoyas. They play for the NCAA Division 1 - Big East Patriot League. Georgetown has an award winning basketball team, as well as a co-ed sailing team that has won 13 National Championships and one World Championship. Also available on campus are more than a few club and intramural sports, such as some of the ones listed above, as well as aerobics, badminton, fencing, figure skating, and ice hockey, among others. Aside form athletics, Georgetown also features more than 200 on-campus student organizations, in a broad range of interests. Student activity groups include an African Society, a Ballroom dance team, a campus magazine, a campus ministry, a cooking club, a creative writing club, a drama society, a film society, and a French culture organization, to name only a few. 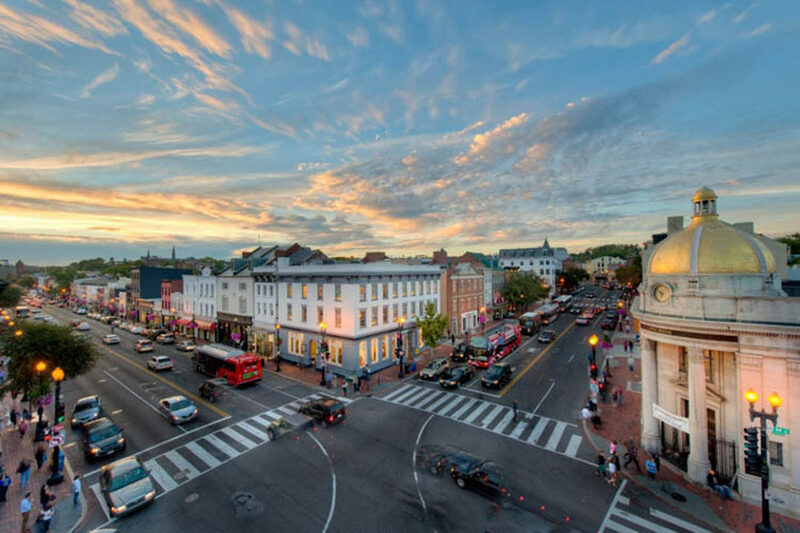 Off campus, Georgetown is one of the prettiest towns in America. 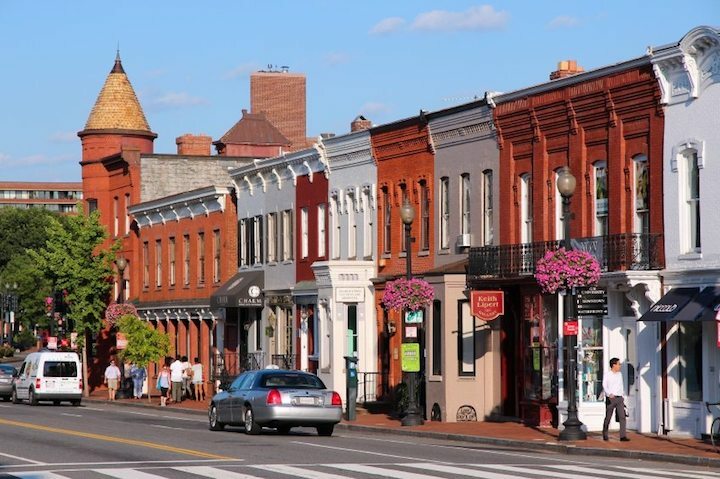 Above: Another quaint Georgetown neighborhood. 8. What are the distance learning options at Georgetown University? 9. What is the contact information for Georgetown University? To reach the main campus of Georgetown, or for general information, call 202-687-0100. For the admissions office at Georgetown, call 202-687-3600. To speak with someone at the Georgetown School of Continuing Studies, call 202-687-8700. To contact the Georgetown Law Center, call 202-662-9000. For questions about degree programs at Georgetown, call 202-687-6299. For questions about certificate programs at Georgetown, call 202-687-7000.